Hey! Did you know Balancing Jane is on Pinterest? It's true! My use of the platform has been a little sporadic, but I feel like it's a good medium to share a collection of excellent posts on a variety of topics, and to that end I have a couple of boards that I use to keep track of things of a more visual nature. Which I think does a great job of expanding the problems with Photoshop mentality. It's not just about body size and depicting unrealistic expectations of people's bodies; it's also about editing out the quirks and qualities that make us human. 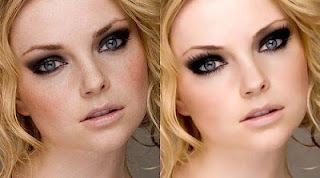 I think that picture on the left depicts a much prettier person than the picture on the right, but we're being manipulated into thinking that freckles and slightly uneven eyebrows are not markers of people, but tragedies that move us further away from beauty (because then we'll buy expensive tweezers and skin cream). I also have a board called Fitness and Body Image that I just started in the vein of posts like this, this, this, and this. I believe that fitness comes in many sizes and that being healthy is much, much more important than being thin. I've been reading blogs like Dances with Fat, Anytime Yoga, Black Girl's Guide to Weight Loss (even though the title suggests the goal is weight loss, this blog is about way more than that), and Feminist Fitness. These writers have helped me to find what I can only describe as a transformation in my way of thinking. It wasn't very long ago at all that I thought fitness success could only be measured in pounds and inches, and--as long as that was my yardstick--I was destined to meet with disappointment that I turned into failure (and the immediate return to bad habits). Recognizing that fitness isn't about size and even that--yes--I can care what I look like without making it focal point of every goal has given me the ability to make sustainable changes to my eating and exercise habits. I want to use that Pinterest board to help promote fitness and health at every size approaches that focus on strength rather than weight, endurance rather than how far the gap is between someone's thighs. I haven't used Pinterst to share boards before, but I know that a lot of you out there are interested in similar HAES approaches to fitness, so if anyone would like to be added as a pinner for that board, let me know! I'm excited you're on Pinterest! Sometimes it makes me want to buy things (which I don't like), but I'm a very visual person and it is a great way of bookmarking things for me. Yeah, I have to stay away from all the pretty things to buy . . .